James Johns (1797-1874), Vermont Autograph and Remarker (Huntington, Vt.), 1 December 1854. 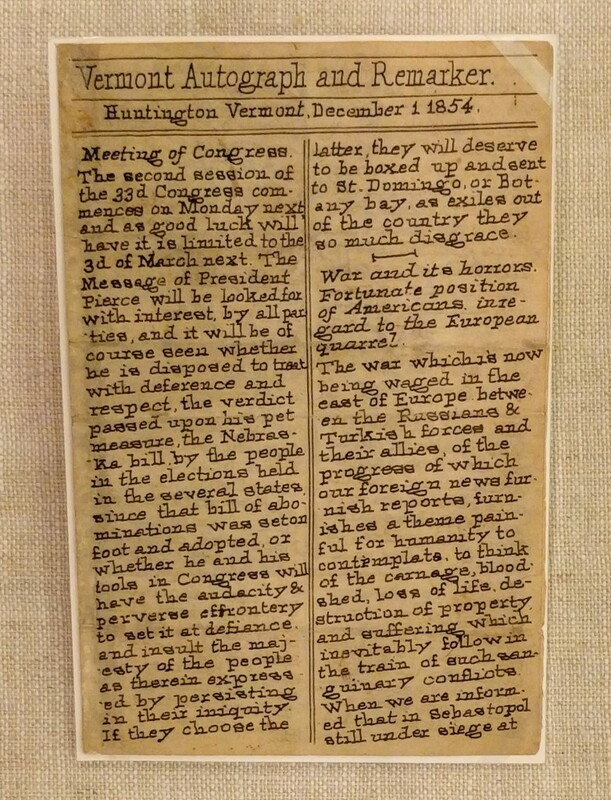 Were it not for its upward slanting lines of text, one might guess this tiny newspaper rolled off a press, but it was “pen printed.” Pen printing was a form of precise penmanship which strove to mimic type. 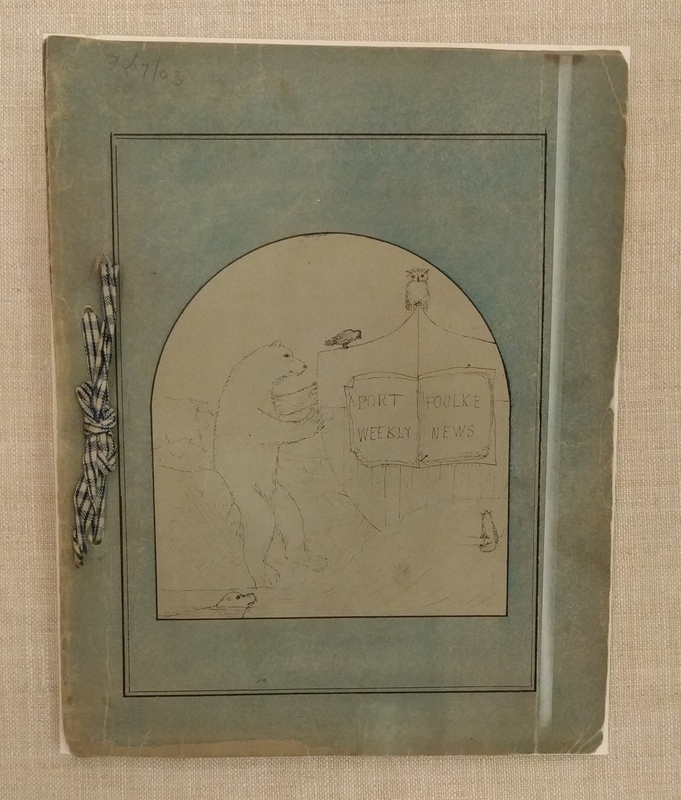 A master of the art, and the creator of this issue of the Vermont Autograph and Remarker, was James Johns, self-appointed (and largely self-educated) chronicler of the Green Mountain State. For nearly sixty-five years he churned out stories, poems, sermons, and acrostics, but his occasional newspaper enjoyed the widest circulation. He distributed it for token sums (but more frequently gratis) between 1833 and 1873. 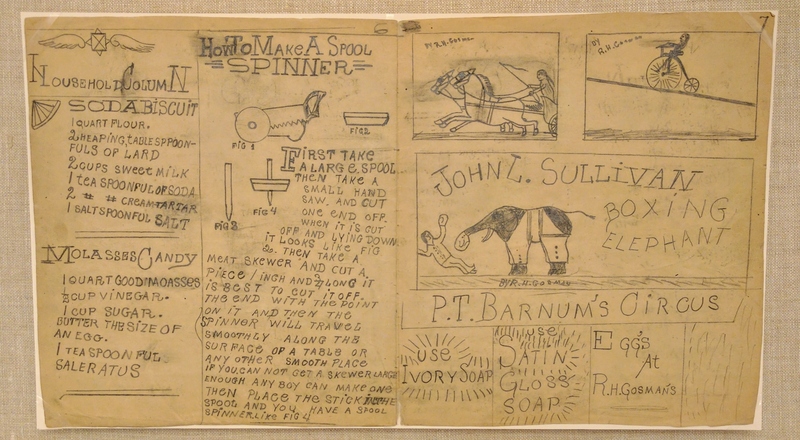 Although Johns acquired a hand press in 1857, it lacked sufficient type to ink all four pages of the paper simultaneously, so he reverted to his tried — and quicker — method of pen printing. 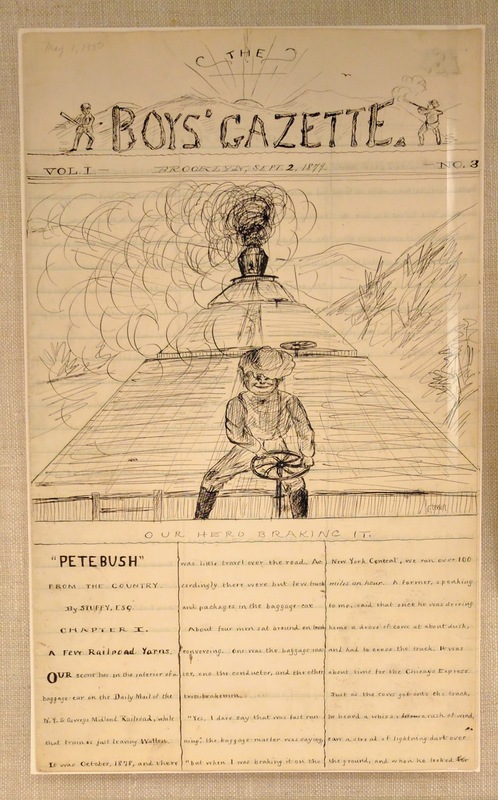 Port Foulke Weekly News (Foulke Fjord, Greenland), vol. 1, no. 3 (25 November 1860). Our readers no doubt think it very funny to write an Editorial; thermometer below zero, ink frozen, imagination congealed, memory gone with the summer, thoughts in the sunny south, and feet wrapped up in furs. But there’s no fun about it. . . . The Editor has a very uneasy chair. His bed is not a bed of roses, but a bed of ice. He eats ice, he drinks ice and he even smells ice. His editorial brethren have abandoned him to his fate, and he feels that there is nothing but ice in all the world. Ice! Ice!! Ice!!! Prison Times (Fort Delaware, Delaware City, Del. ), vol. 1, no. 1 (April 1865). 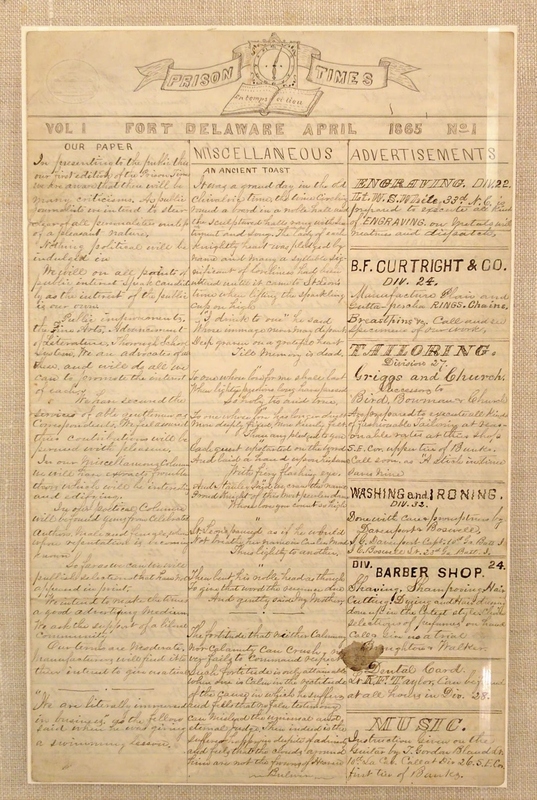 In April 1865, near the end of the Civil War, the Confederate detainees at Fort Delaware, on Pea Patch Island, created a manuscript newspaper, the Prison Times, which so closely mimicked printed publications that it included a masthead, motto (“en temps et lieu,” or “in time and place”), and advertisements for shoemaking, dentistry, and other services available in the camp. There were even debating clubs. The contributors’ wish to be “far away in our loved Sunny South” before they could have time to produce subsequent numbers came true: the hostilities ceased soon after this issue came out, so it remains an anomaly. Four copies are known to survive, each in the meticulous script of Captain J. W. Hibbs of the 13th Virginia Infantry, C.S.A. William Wright Patterson (1865-1887), Yankee Boys, vol. 1, no. 4 (19 October 1878) and The Boys’ Gazette, vol. 1, no. 3 (2 September 1879). 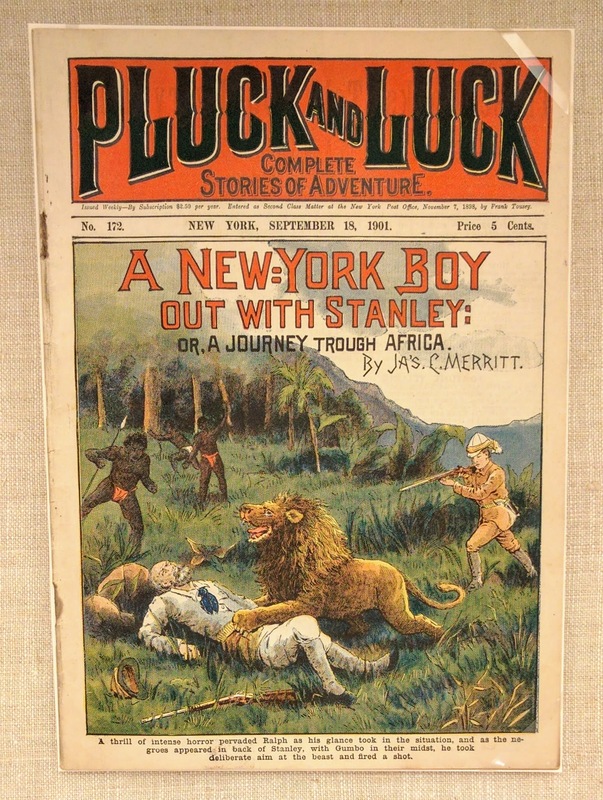 Some children of the nineteenth century, like Brooklynite William Wright Patterson, were inspired by publications such as The Youth’s Companion and St. Nicholas Magazine to write and illustrate their own periodicals. 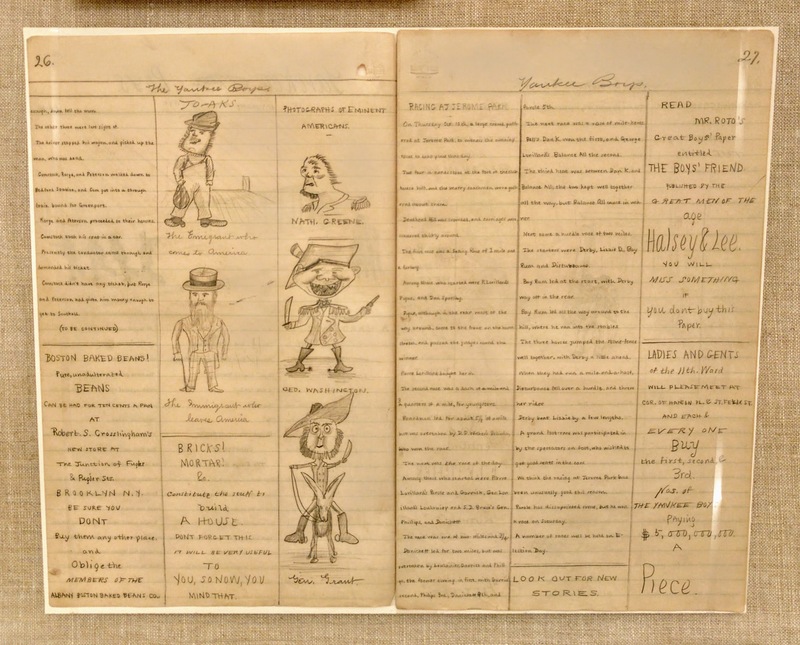 William’s contained a mix of sporting news (“Racing at Jerome Park”), advertisements (“BOSTON BAKED BEANS!”), and “photographs” of eminent Americans (note the toothless George Washington in the issue of Yankee Boys). Judging by the pictures of trains scattered throughout his Boys’ Gazette, William clearly fancied travel. Sadly, though, it seems his only major journey came near the end of his short life, when his parents sent William and his wife (he married at nineteen) to California in a futile attempt to fight off an illness. He died back in Brooklyn at age twenty-two. 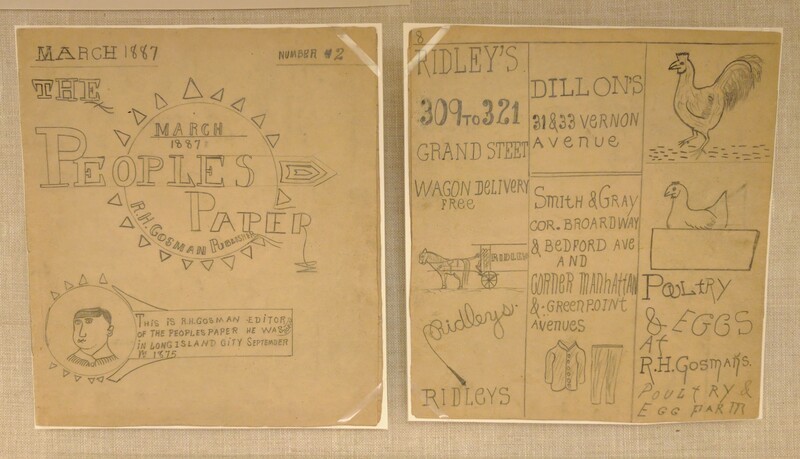 Richard H. Gosman (1875-1946), three issues of The Peoples [sic] Paper, March, April, and June 1887. 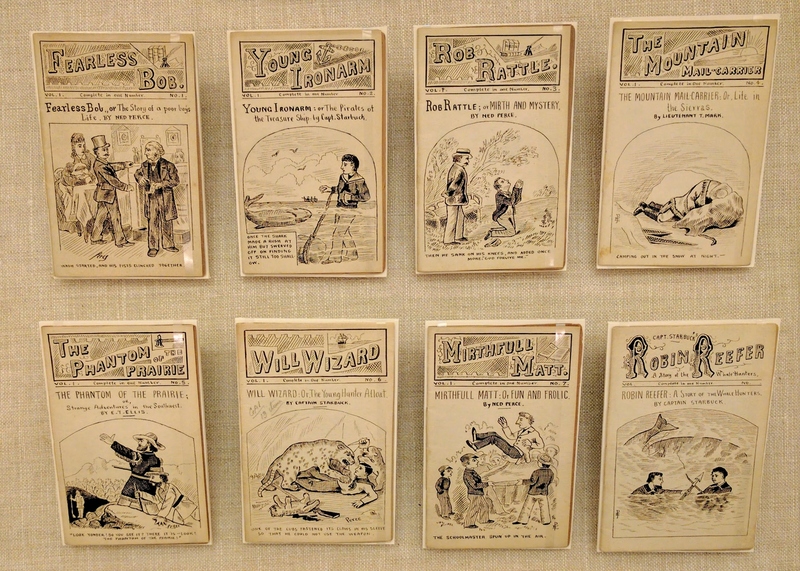 Eight anonymous manuscript “dime novels,” late nineteenth or early twentieth century.